At the moment I’m focused on short-form writing, mainly for Transformation, the e-zine I launched in 2013. But prior to 2013 I published quite a number of books that may be of interest and which are all still widely available. Most of the early titles explore the changing world of NGOs and nonprofits, including how to scale-up their impact, strengthen their accountability, adjust their roles, improve their management, and deal with globalization and global governance. Future Positive was my attempt to re-vision the broader system of foreign aid and international cooperation. NGOs are only one small part of civil society of course, so in 2004 I decided to look at the broader universe of voluntary associations and citizen’s groups and at how that universe was changing. The result has become a standard textbook on university courses and elsewhere, being updated in 2009 and 2014 to take account of new challenges and developments. 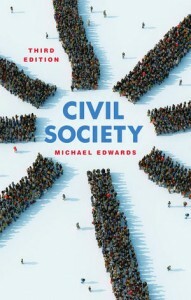 I also edited the Oxford Handbook of Civil Society to provide a deeper account of a rapidly-expanding field of knowledge and scholarship. At the same time I became interested in the field of philanthropy, and how giving was being affected by the trend to see business and business thinking as the solution to everything. 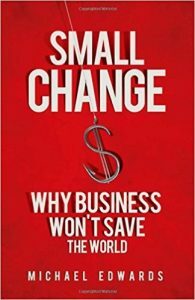 To counter that trend I wrote a polemical pamphlet in 2008 called Just Another Emperor?, which was later expanded into a book called Small Change: Why Business Won’t Save the World. Since independent bookstores are so important to maintaining a diverse range of voices and perspectives it would be great if you could buy or order any of these books from one of them, but if that’s not possible then you can visit my author page on Amazon.com by clicking here. Or if it’s more convenient you can visit Amazon UK or Canada, or their equivalents wherever you live. Thanks for your interest in my writing. I hope you enjoy my books.